Yet, in every country of the world, women still suffer some form of direct or indirect discrimination. Empowering the female gender to reach full potential requires equal opportunities and equality. Better access to paid employment, sexual and reproductive health and rights, and decision-making power in public and private can ensure development is equitable and sustainable. In many areas of the world, this has not been the case to date, although the situation is improving. Tourism can help play a major role in equality and empowerment. Child marriage is most common in Southern Asia and sub-Saharan Africa, at rates of 44% and 37% for under 18s respectively, and 16% and 11% for girls under 15 years old. Globally, the marriage of girls under age 15 declined from 12% in 1990 to 7% today. Female Genital Mutilation is a human rights violation. Although it has declined by more than 25% over the last three decades in the 30 countries where the practice is concentrated and an entrenched social norm, more than 1/3 girls aged 15-19 have undergone the procedure, versus ½ in the mid-1980s. Physical and/or sexual violence is most common at the hands of an intimate partner. This affected 21% of the girls and women aged 15-49 years in the 12 months prior to interview (from available comparable data from 52 countries, including only one from developed regions). 49 countries have no laws specifically protecting women from domestic violence (PwC, Navigating the SDGs, 2016). Sexual and reproductive health and rights are determined by 52% women aged between 15 and 49 years (2012 data for 45 countries, of which 43 developing). Inequality puts women at increased risk of acquiring HIV, the leading cause of death for women of reproductive age worldwide. In education, worldwide, in 2013, two thirds of the 757 million adults (aged 15+) who were unable to read and write were women; 1 in 10 girls were out of school, compared to 1 in 12 boys. Unpaid and domestic work represents 19 % of women’s time each day versus 8 % for men, across the regions of the world, for example care-giving, cooking, cleaning and other household tasks. In paid work, women worldwide make 77 cents for every dollar earned by men. Professionally underrepresented, women in the science, technology, engineering and maths (STEM) sectors, including health professionals, are still only 13% of the workforce, despite significant progress. Women are also underrepresented in the sporting community and all-female events receive significantly less coverage in the media compared to equivalent all-male events. (Exxpedition, 2017). In power, women are under-represented. They hold only 23% of parliamentary seats worldwide, a decade slow rise of 6 percentage points. In managerial positions, fewer than 1/3 senior- and middle-management positions in 67 countries were held by women (2009-2015). Gender inequality persists worldwide, depriving women and girls of their basic rights and opportunities. There cannot be sustainable development if there is no gender equality and empowerment of women. Gender equality is integral to each and every sustainable development goal. Women’s empowerment is a precondition to solving poverty and resource issues and peace. Equality will require vigorous efforts and legal frameworks, to counter deeply rooted gender-based discrimination. Thankfully, social norms can and do change. In most regions of the world, women make up the majority of the tourism workforce, representing 55.5% hospitality globally, up to 70% in some regions (International Labour Organization). That said, women in tourism tend to be in the lowest paid and lowest status jobs, and women perform a large amount of unpaid work in family tourism businesses (UNWTO and UN Women). It’s also of note that women “also tend to work exclusively with women. Such gender segregation affects pay, access to training and, hence, to better paid work” (Equality in Tourism). "More must be done to close the gender gap, in particular ensuring equal pay for men and women for equal work, raising employment quality and ending all discrimination." How can Tourism help achieve Gender Equality for Women and Girls? - Michelle Bachelet, Executive Director of UN Women at First International Congress on Ethics and Tourism, September 2011. Tourism can empower women in multiple ways, particularly through the provision of jobs and through income-generating opportunities in small and larger-scale tourism and hospitality related enterprises. As one of the sectors with the highest share of women employed and entrepreneurs, tourism can be a tool for women to unlock their potential, helping them to become fully engaged and lead in every aspect of society. One of the reasons RSC decided to set up in Malawi is that it is supportive of gender equality! Women were included in the labourers that build Tiger Mountain Pokhara Lodge, a community workforce which has since trained to be retained into different positions at the lodge. At Chumbe Island Coral Park, a women’s cooperative produces all the organic soaps used in the banda bungalows. Jicaro Island Ecolodge support a group of local women to set up a business sewing clothes for sale. SEED Madagascar’s Stitch Sainte Luce trains women in producing and selling high quality embroidered products, language and business skills to provide a sustainable livelihood. Initially, 11 women were trained in embroidery and finance, allowing them to manage the £4000+ they made in commissions and going on a train a further 37 “associate embroiderers”. A second project phase saw 12 more women trained, and sales increased by 48% via better marketing. Now in its 3rd phase and a standalone business, with a studio & shop showroom purpose built in 2015, the members have further disseminated their skills to the wider community and the international market for products developed. As a result, the women and their families’ health improves, able to buy better food, go to the doctor more often, and their children’s ability to attend education. They also support others in the community - an average of 11 extra people per woman. In Malawi a village banking initiative offers small financed loans and education projects for women to set up in business and train. Education helps women access employment, income, and greater economic equality, both personally and professionally, the increased education of girls accounting for over 25% growth in OECD countries over the past 50 years. Universal access to quality higher education brings lifelong learning opportunities and wealth disparities. In Muslim Zanzibar, Chumbe Island promotes gender equality through its Environment Education programme: Between 2000 and 2015, 48% of student visitors were girls. In a country where women never normally learn how to swim, Chumbe offers a unique opportunity to learn to snorkel and see coral reef. The popularity of the programme is demonstrated in increasing applications and yearly trips and extended in 2015 through their first grassroots soccer camp. Tiger Mountain Pokhara Lodge’s school support has not only enabled classes to be taught to School Leaving Certificate level locally, but this means female students who would otherwise not go away, can complete their education. When the lodge was built, the local village permitted the lodge the use of a nearby spring to be fitted with public taps. This not only benefitted the community in local access to water, but also meant girls had more time for education, previously spending much more time fetching water from a distant source. In Kenya, MWCT hold regular friendly youth sports tournaments to encourage health education, promotion, awareness and counseling including for Female Genital Mutilation (FGV) and HIV/Aids, including voluntary testing. SEED Madagascar’s health education works with young people to raise awareness of safety prior to establishment of sexual practices, which can be as young as 11 in the region. And with women to offer increased access to quality sexual, reproductive and maternal health information, increasing awareness of healthy practices during pregnancy and birth. At Campi ya Kanzi in Kenya, it was realised the Maasai girls were losing the ability to bead. Older Maasai ladies were employed to teach the girls beading, with the handicrafts sold in the shop, later augmented with more Kenyan jewellery, clothing, books, bags and other handmade arts and crafts, bought locally at fair prices. In 2017, Exxpedition charted an all-female crew on a 3-part mission to circumnavigate the British Isles, to explore the issue of chemicals, endocrine disruptors and carcinogens in our personal and global environment, sampling the waters for plastics and toxics. You can join further trips planned with their Pangaea Exploration partnership. Less women in science, technology, engineering and maths (STEM) is one reason for the all-female crew. Additionally, historically, studies on the effects of chemicals on human health have largely focused on the specific effects on men (Exxpedition, 2016), as they made up the majority of the workforce where occupational studies have taken place, or because effects can often be more easily determined in men compared to women. As a result, research on female-specific diseases has held a relatively low profile. This imbalance in research is becoming increasingly important as the incidences of fatty tissues (where plastic toxics accumulate) and non-communicable diseases, such as cancers, are increasing, and we seek to understand the effects on hormones, fertility, birth defects and the passing of chemicals from mother to child. As women are also underrepresented in sailing, the wider sporting community all-female events receive significantly less coverage in the media than all-male events, the eXXpedition crews of inspiring females are assembled to help redress the balance. There are fantastic initiatives that look to redress gender inequality in tourism by showcasing women’s work or helping female tourism workers, often in very male-dominated societies. Through tourism, women can be offered equal opportunities in education, work, income, skills development and equal access to resources, technology, ownership, control and finance can play a huge part in empowering women to take a more active and equal role in society, along with changing attitudes to greater acceptance, and so less exploitation and discrimination. There is still much to be done! Goal 1 - End Poverty: Tourism provides jobs, income and entrepreneurial opportunities at community level, empowering less favoured groups such as women, and all in areas of a country that other sectors might not reach. Goal 3 - Health & Well Being: Globally, women face gender-based inequalities, putting them at increased risk of HIV, violence and death. Goal 4 – Quality Education: Universal access requires elimination of gender disparity, for lifelong opportunity for jobs and economic equality. Goal 6 - Clean water access and sanitation: Women and girls’ time is often consumed carrying water for distance and looking after children with ill health due to poor sanitation. Access can buy time for women in education and work. Goal 8 - Decent Work and Economic Growth: ‘Full and productive employment and decent work for all’ means equal pay for work of equal value for women. This is important for equality, and greater purchasing power by women, leads to economic growth in new sectors. Goal 9 - Industry, innovation & infrastructure: There can be no inclusivity, resilience and sustainability if one half of humanity is denied rights and opportunities. 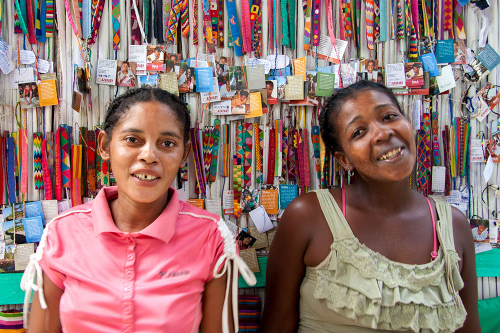 Goal 10 - Reduced inequalities: By supporting equality in employment, and pay, women can contribute to renewal & development, reducing regional imbalances by giving communities the opportunity to prosper. Goal 11 - Sustainable Cities & Communities: Inclusive, safe, resilient and sustainable communities good for women are good for all citizens. Goal #16 - Peace, Justice & Strong Institutions: Inclusive societies help promote peaceful sustainable development, and are vital for post-conflict stability and socio-economic growth.